A week and a half ago, I received the first bottles of essential oils I have ever owned in my entire life. Never used them, never tried them, ever. A very good friend of mine from high school uses doTERRA oils and had been contacting me to attend one of her classes where she teaches people how to use them. I had been meaning to pick some up ever since the summer when I started making homemade laundry soap. If you recall, I picked up a pickle bucket from a local pizzeria. I thought it might be nice to scent the soap with some lavender or citrus to help combat the dill that still lingers in my bucket. Well, I never made it to one of my friend's classes. I seem to have a really hard time with stuff like Mary Kay, jewelry parties, candle parties, you know places where you feel obligated to buy something even if you don't want to? I always end up buying something and then regretting it because it was either too expensive or something I never really needed or ended up using. I honestly thought essential oils would turn out the same way. I wanted to try them, but didn't really NEED them, and was doing just fine without them. So, to be a good friend to my friend, I decided to buy some oils from her. But I didn't know what to buy because I really didn't know anything about them. And I don't like to waste money so I did my homework on what oils to spend my money on. A couple days, LOTS of articles, and several YouTube videos later, I made my decision on what to purchase. Before I tell you what I ended up buying, let me tell you a little about what I learned. First of all, I learned that I really didn't know ANYTHING about essential oils! I thought they were something to make things like soaps and lotions smell good. And that's about all I knew. But what I learned was they are actually capable of doing so much more. Essential oils are the aromatic compounds found in roots, plants, trees, flowers and fruits. Yes, they do smell good but these aromatic compounds actually protect and are vital to the plant, and they each have their own unique qualities that can benefit our own health as well. The best part is, they're pure and 100% natural. Getting our home and the foods we eat as chemical-free as possible is something we have been passionate about, so this seemed right up our alley. The more I learned about essential oils, the more excited I got! When I read a clinical trial study on essential oils, I was SOLD. Essential oils actually have the ability no antibiotic or medicine has. They have the ability to pass through a cell's membrane and fight off viruses! So before I ever even put an oil on my body or smelled one with my nose, I knew this was something my family needed. Do you ever JUST KNOW something is right for you, that deep down inside you know you're making the right decision? Essential oils just fit our family, they embody everything we're about......and God made them, not a chemist. That alone was more than enough for me. With confidence, I texted my friend and told her we wanted the Home Essentials Kit. It came with ten bottles of oils, a free bottle of Frankincense, a wholesale membership, and a diffuser. We know there isn't a magic pill or oil that can heal years and years of a poor diet, lack of exercise and loads of chemicals our bodies were never designed to handle. I promise to be completely honest about our experiences with these oils, and hopefully our stories will help you on your own wellness journey as well. Here are a few of the resources I reviewed before making my first purchase. I have others, so please just ask if you want more. I found it's not easy finding good, credible information on them. Please let me know what you think. Do you use oils? Which are your favorites? I'd love to hear your stories. 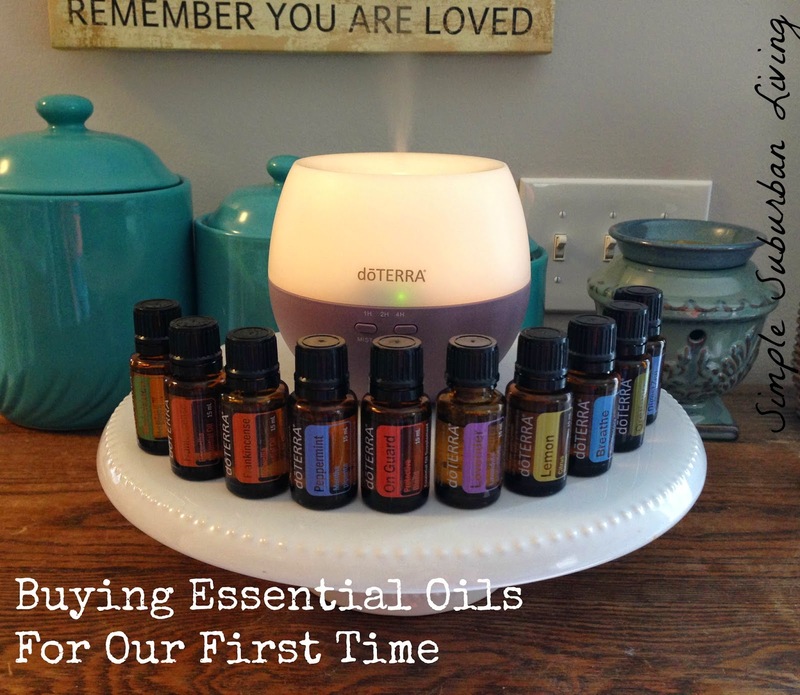 I have been really thinking about buying and possibly selling essential oils - everyone seems to love them!! I am a total believer in herbs and oils - just never tried to make them or sell them. I have a son with serious health issues and thinking these might benefit him too. Good for you! I'm excited to hear more about your journey. Although I've used a few essential oils for almost 20 years I'm spending this year really digging into them. It's exciting and yet I'm proceeding with caution. One thing I tell my children all the time is, "If you use it medicinally, it's medicine and should be respected as such." Thanks for sharing at Simple Lives Thursday; hope to see you again this week.